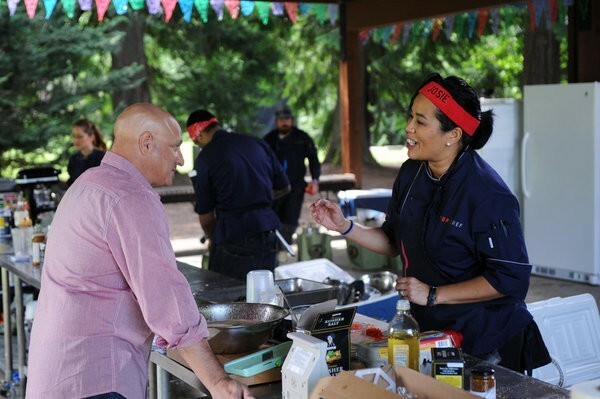 Top Chef: Seattle Episode 7:Foiled Again Review Plus Food & Wine Magazine Subscription Giveaway - Are You Screening? 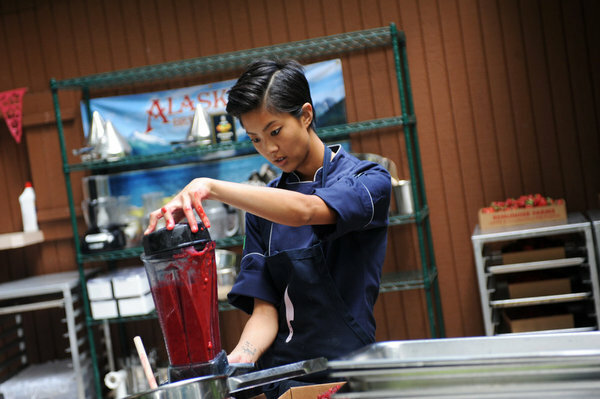 Episode 7 of Top Chef: Seattle certainly had some ups and downs, though it didn’t end up nearly as rough as the episode that only had downs a couple of weeks ago. Next week, Top Chef meets Roller Derby, and to help celebrate all the general Top Chef goodness, I have a great giveaway for you. 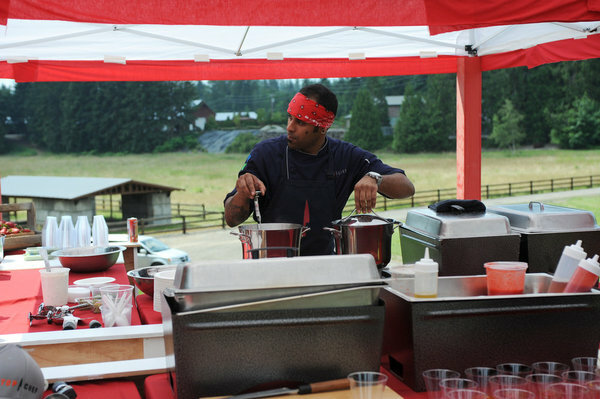 In the quickfire, the cheftestants basically got handed something of a nonsensical challenge. I’m all for the quickfires, even if they don’t make that much sense, but sometimes they’re just foolish. This time, they found themselves in a kitchen filled with products wrapped in aluminum foil. They could take anything they wanted, but once they unwrapped it, they had to use it. Worse, they had to cook in the foil, so no pots or such. Though somewhat fun, especially as people unwrapped things to find very different ingredients than they thought they were going to get, the challenge wasn’t especially interesting. 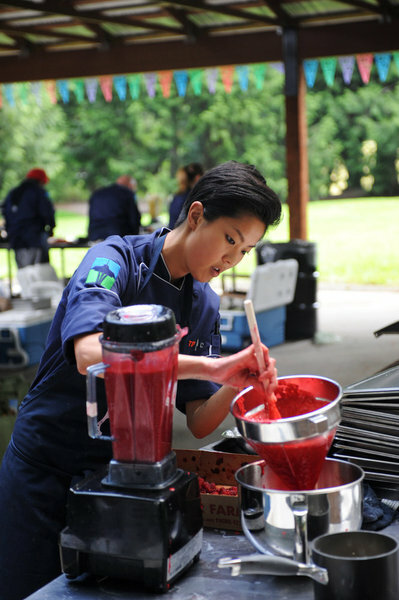 Moving on to the elimination challenge, it was a battle of the berries, as the chefs were paired up and then given a berry to work with, as they created food for a berry festival. I really liked the head-to-head competition theory we got this week, and even though I might have liked it better during a non-berry week, it made for some interesting competition. There were a few dabs of drama as we progressed, though the heated discussions we’ve seen throughout the season already seem to have been put aside for the most part. On the other hand, Josie seemed to dominate the episode from every direction. If it wasn’t the bewildering outburst as we entered the episode, it was the bizarre act she put on as she served her food.With her dish requiring more prep than she anticipated (and far more than any dish should need given the setting), Josie found herself unsure what to do with the time, and met everyone with a nervous song and dance that had the judges raising their eyebrows. Actually, Tom even jokingly asked if she was high. In the end, while it was a somewhat worthy episode and it was a nice change to focus on berries, it wasn’t the most entertaining we’ve seen, and the elimination wasn’t much of a surprise. 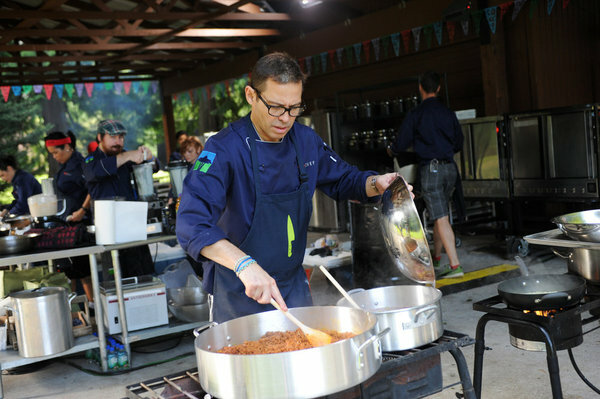 The season is settling into a mid-season rough spot that we often see on other reality shows, which stems from the fact that as we get to know the chefs, we’re pretty sure we’ve spotted around half of them that can’t win. As they get picked off week by week, it isn’t much of a surprise. These are the weeks that need entertainment beyond the suspense more than the start and end of the season, and this week didn’t have quite enough of it. Next week, on the other hand, has all the tune in power it needs, because there is going to be Roller Derby involved. You don’t want to miss it. Make sure to tune in next week, and stick around for Last Chance Kitchen. Also, don’t forget to cast your vote to Save a Chef – You can vote right now to save either Kuniko or Danyele. Below you can check out a teaser/clip from the Berry Battle, a preview of next week’s fun, and enter the giveaway! The giveaway is for a 12-month subscription to Food & Wine magazine. Just use the widget below to enter!